UCI looking to host an African worlds for the first time. Rwanda has often been mentioned as a possible host for the World Championships, because of its very popular Tour of Rwanda and love of cycling. South Africa has experience in hosting major cycling championships, having hosted the Mountain Biking Worlds in 2013 and the Para-Cycling Worlds in 2017. Finances are always a key question when bidding for World Championships, starting with a multi-million fee that has to be promised as part of the bid. Bergen was left with a huge debt from cost overruns after hosting the Worlds last year. Italy has still to confirm its bid to host the 2020 World Championships after political delays in confirming government funding. Yorkshire will host the 2019 World Road Race Championships, with the 2018 World Championships to be held in Innsbruck, Austria. The top five African nations on the CQ rankings are South Africa, Eritrea, Rwanda, Algeria and Morocco. Eritrea would be very interesting given its recent sporting successes, but is so small and so poor it's hard to see it working. Perhaps the recent normalisation of relations with neighbour Ethiopia could give rise to an interesting unity bid? Perhaps not. Rwanda has a bit of a reputation for finding the money for major eye-catching projects, as do Gabon (host of La Tropicale Amissa Bongo), who might also have a shout. Algeria often have a bit of cash but the oil price is relatively low so probably in a belt-tightening phase for them. Morocco (and Algeria) could be logistically quite convenient for most of the peloton. A Marrakesh Worlds with a circuit through the foothills of the Atlas mountains could be something quite special, and Morocco might just about have the finances for it - they were bidding for the 2026 World Cup just recently. South Africa hard to look past based on both the success of their riders and their general wealth versus the rest of the continent. Overall I think this is really positive. Locating the Worlds all around, well, the world is fitting. For me, a much better way to spread cycling than strongarming the B-teams of the World Tour into various new events across the globe. If the UCI can find it in them to work with the host regarding the costs, then they might just be able to pull off a real coup here. Any thoughts on your dream African worlds? I don't really care where they do it, tbh, although I'd prefer it if it wasn't one of the countries sharing shores with Europe. As long as they leave behind all the bikes that are taken that way, making a grand gesture towards the local grassroots teams. Not Rwanda, please. But well, they've already been to Doha, so you can expect anything of them. 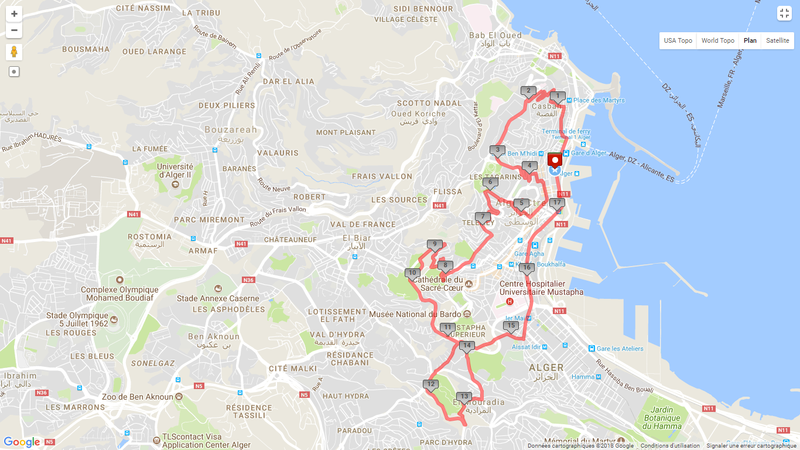 By the way, I've designed a route in Algiers, with uphill finish on the Casbah. There’s something wrong with that route actually. It’s crossing itself at some point(route I’ve designed two years ago, I think). This one should do. This time, the Casbah is the first climb. Start and finish is on the seaside. 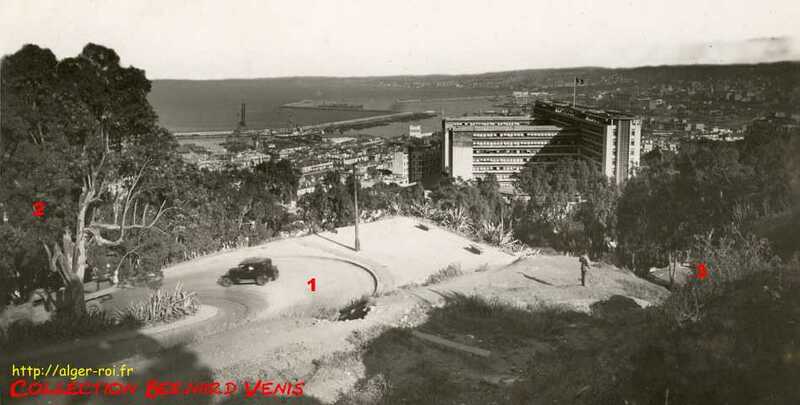 Casbah is 2.39km at 5.4% av. gradient, the way I calculated it. Not the hardest climb of the route but a place where much history has been made and I wanted to include it on the route. The Dey of Algiers had his palace there. It was the main setting of the 1957 Battle of Algiers and Julien Duvivier’s 1937 film « Pepe le Moko » starring Jean Gabin was an ode to it. It’s a unique medina with typical architecture and its narrow streets are lovely. Then you have the descent of the « Route des 4 canons », down to the Place Emir Abdelkader, named after the great hero against the colonisation. 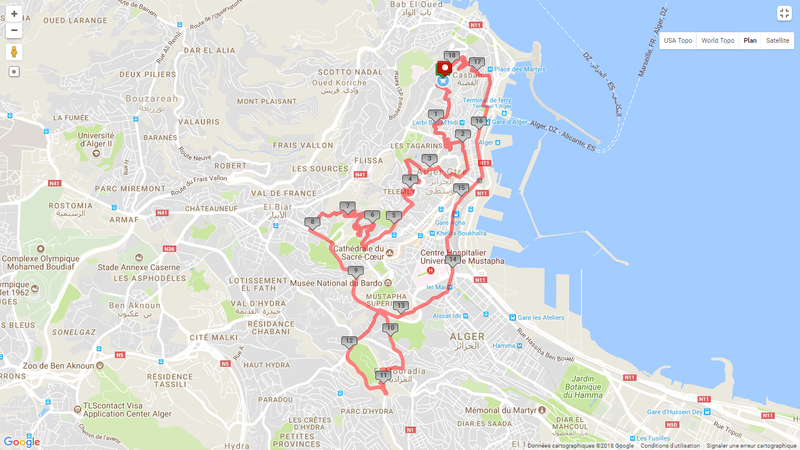 Then two major climbs : 1.44km – 6.9% and 2.33km – 4.6% up on the « Balcon Saint-Raphaël ». I really like that route but this is unlikely to happen any time soon and I would like Algeria to recognise the massacre of « Harkis » before it can take place.